"WHO AM I?" is a BRAND NEW CHILDREN'S BOOK, written and illustrated by Anita Shaw, for the age group of 5-8 year olds - the most important children's book of this era to read with your child! A little girl reaches out for the first time suddenly aware of the world around her. How does she fit in? She feels confused and lost. So she finally turns to her mom and asks "WHO AM I?" "I consider myself to be a 'backward in time visionary' which seems contradictory. But it is meant to be thought-provoking. I refer to someone like myself who channels their creative energies into interpreting childhood memories and family history by using various art forms - in my case writing and painting. I sincerely hope my ideas will resonate with both our current and future generations. "You see, my book and folk art paintings encompass a yearning for a simpler time and place. They also express my vision of 'shared basic experiences and relationships' which hopefully will remain unchanged even as society continues its relentless drive for 'so-called' progress. "That's why I have merged my 'folk art' and 'philosophy' into this new children's book, "WHO AM I?" I urgently want to make children aware that besides today's modern, fast-moving society, they should also take into account their family history and heritage when making decisions, big and small, and planning their future." "ALWAYS FLOWERS" is a beautiful coffee table book, inspired by a Matisse quote: "there are always flowers for those who want to see them." It is a must-have book for the discriminating adult, written and illustrated by Anita Shaw. The book is filled with Shaw's original flower paintings, coupled with poems about flowers by both famous and obscure poets - besides a chapter on the significance of flowers in our civilization and throughout the ages. 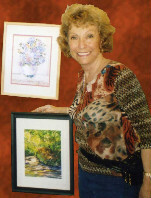 ANITA SHAW is known for utilizing a wide variety of subject matter in her art and now in her books. "I invite you to browse through this website to look at my paintings and books. So sit back, relax and enjoy "ShawismsFineArt." I hope that what you see will encourage you to bring something of my inspiration into your life, and that of your children." TO ORDER BOOKS: Click on "New in the BOOKSTORE" above and follow directions using "Paypal" on this secure site. We provide FREE SHIPPING in the U.S.